upon drawing the bold from regular weight the side bearings have shrunk while the glyph widths have grown. I'm wondering if there is a general rule to space and kern the bold weight based off of the existing metrics established for the regular? I tried adding the amount that was lost for each side bearing back (thereby increasing the overall character width) while making no adjustments to the kerning tables, but this does not look right, as spacing becomes too generous. This is for a low contrast sans-serif. Like most cases in type design, there is no such rule. See what looks good to you, looking only at the Bold first. Then compare the bold to the regular, then set one paragraph in regular, one in bold, and one mixed. Trust your eyes. It can also help to compare the overall looseness/tightness of your design to existing typefaces, or tighten/loosen spacing in inDesign to get an idea for what works. Lastly, kerning will also have to be redone from scratch. Don't start kerning, until the spacing is perfect. Space inside the letters relates to the space between them. Typically, a bolder typeface has smaller counters, and (approximately) proportionately smaller sidebearings. @Thomas Phinney If one made the bold 50% heavier than regular and allocated two thirds of the weight to the interior stroke or counters and one third to the exterior (affecting overall width), is it safe to assume the sidebearings would be reduced by one or a combination of these ratios? What Thomas said, but I would add, these things are usually determined by eye, not by applying a mathematical formula. If one made the bold 50% heavier than regular and allocated two thirds of the weight to the interior stroke or counters and one third to the exterior (affecting overall width), is it safe to assume the sidebearings would be reduced by one or a combination of these ratios? Not really, because the spacing of type relates to a) the optical mass of the glyphs being spaced, b) the regularity of spacing of related exterior shapes independent of internal counter (e.g. the right side of the a and the right side of the n typically have similar sidebearing measurement from the stem, despite the very different shape and size of counters/apertures), and c) the need for the letters to knit together into legible words (hence, the spacing of very light glyphs is seldom as wide as their internal counters might suggest, and the spacing of very heavy glyphs is seldom as tight). Fascinating. I guess it's partly this relationship we have to type that make its nuances so interesting to work with. Thanks for the clarification. You might do better to draw the Extra Bold and Thin (basically a single path, with stroke width applied of 20 units—on a 1000 unit em) first, and interpolate the other weights between. I think that's something one needs a certain amount of experience to be able to do if one has something like an intermediate, nominal Regular weight in mind. 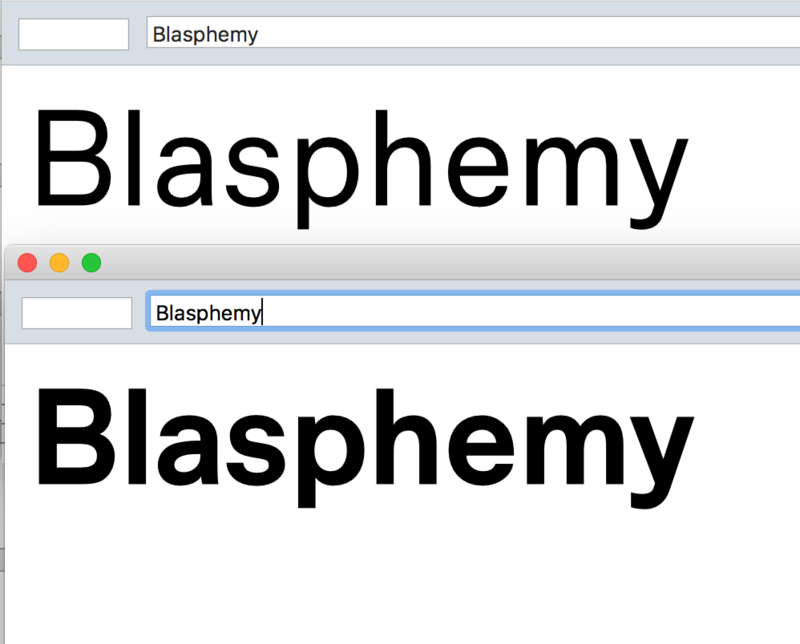 Lastly, kerning will also have to be redone from scratch. I don’t necessarily agree with this. Depending upon the relationship between styles, I have found that I can often start from previous kerning. If I am methodical and consistent in my development of a heavy weight, in fact, many pairs can share the same value across fonts, and other pairs may take a common adjustment. This will not always be possible, of course. And not to the same degree with all styles of type. But neither is it inconceivable. There is no fixed formula, but there can be rational relationships and, with experience, one can be methodical about it all. And, yes, the eye should be the final arbiter. Certainly, one can start with the Regular. Then derive the Extra Bold from it by various transformations, and refine that by eye. At the other end of the scale, copy the Regular into a background layer and draw the Thin over it. Once these two are looking good, then interpolation takes care of the in-between weights, with no need for metrics “rules” or formulæ—which is the topic here. If one works outwards from the Regular, using “add/remove weight” transformations each time, it’s very laborious. Furthermore, having to address the extreme weights early on in the design process is salutary, as it helps clarify the essence of a design that can be consistent across the full weight spectrum. After a close look at some of the well-designed typefaces I own, I think it's safe to start from existing kerning given the context. It seems low-contrast sans for the most part share a very high level of relationship in space, counters and forms between regular and bold weights. I don't know if this is a correct or common working practice but I've found first applying a formula like (make all strokes 53% heavier and distribute 1/3 of that weight to exterior and 2/3 to interior counters) and then going back over the individual glyph and adjusting curves and points by, then finally looking at the glyph within the context of similar groups (circular, diagonal, square, etc.) and making further adjustments by eye as needed. The eye plays the biggest role in this process and it seems to be working so far. I attached a screenshot of a first pass at the bold. The spacing is obviously now off but I should be able to work from the existing metrics right?